NASA's Mars Exploration Rover (MER) Mission is an ongoing robotic mission of exploring Mars, that began in 2003 with the sending of two rovers — MER-A Spirit and MER-B Opportunity — to explore the Martian surface and geology. Primary among the mission's scientific objectives is to search for and characterize a wide range of rocks and soils that hold clues to past water activity on Mars. The mission is part of NASA's Mars Exploration Program which includes three previous successful landers: the two Viking landers in 1976 and Pathfinder in 1997. 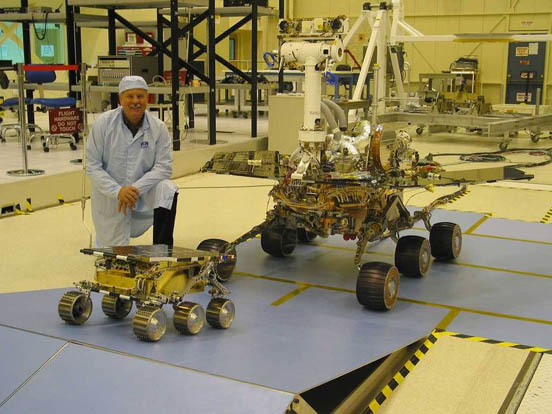 The total cost of building, launching, landing and operating the rovers on the surface for the initial 90 Martian-day primary mission was US$820 million. Since the rovers have continued to function for over five years after landing they have received five mission extensions with the fifth mission extension, which was granted in October 2007, being until the end of 2009. The total cost of the first four mission extensions was $104 million and the fifth mission extension is expected to cost at least $20 million. In July of 2007, Martian dust storms blocked sunlight to the rovers and threatened the ability of the craft to gather energy through their solar panels, causing engineers to fear that one or both of them might be permanently disabled. However, the dust storms lifted, allowing them to resume operations. In recognition of the vast amount of scientific information amassed by both rovers, two asteroids have been named in their honor: 37452 Spirit and 39382 Opportunity. The mission is managed for NASA by the Jet Propulsion Laboratory, which designed, built and is operating the rovers. During the next two decades, NASA will conduct several missions to address whether life ever arose on Mars. The search begins with determining whether the Martian environment was ever suitable for life. Life, as we understand it, requires water, so the history of water on Mars is critical to finding out if the martian environment was ever conducive to life. Although the Mars Exploration Rovers do not have the ability to detect life directly, they are offering very important information on the habitability of the environment in the planet's history. NASA's Mars Exploration Rover Spirit casts a shadow over the trench that the rover is examining with tools on its robotic arm. 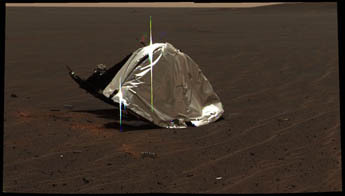 Spirit took this image with its front hazard-avoidance camera on February 21, 2004, during the rover's 48th martian day, or sol 48. On January 21, 2004, the Deep Space Network lost contact with Spirit, for reasons originally thought to be related to a thunderstorm over Australia. The rover transmitted a message with no data, but later that day missed another communications session with the Mars Global Surveyor. The next day, JPL managed to receive a beep from the rover, indicating that it was in fault mode. On the 23rd, the flight team succeeded in making the rover send. The fault was believed to have been caused by an error in the rover's Flash memory subsystem. The rover did not perform any scientific activities for 10 days, while engineers updated its software and ran tests. The problem was corrected by reformatting Spirit's flash memory and upgrading the software with a patch to avoid memory overload; Opportunity was also upgraded with the patch as a precaution. Spirit returned to full scientific operations by 5 February. This has to date been the most serious anomaly in the mission. On March 23, 2004, a news conference was held announcing "major discoveries" of evidence of past liquid water on the Martian surface. 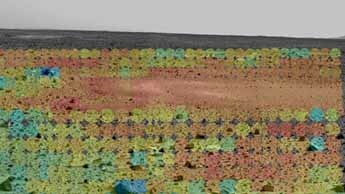 A delegation of scientists showed pictures and data revealing a stratified pattern and cross bedding in the rocks of the outcrop inside a crater in Meridiani Planum, landing site of MER-B, Opportunity, suggesting that water once flowed in the region. The irregular distribution of chlorine and bromine also suggests that the place was once the shoreline of a salty sea, now evaporated. On April 8, 2004, NASA announced that it was extending the mission life of the rovers from 3 to 8 months. It immediately provided additional funding of US $15 million through September, and $2.8 million per month for continuing operations. On April 30, 2004, Opportunity arrived at Endurance crater, taking about 5 days to drive the 200 meters. On September 22, 2004, NASA announced that it was extending the mission life of the rovers for another 6 months. Opportunity was to leave Endurance crater, visit its discarded heat shield, and proceed to Victoria crater. Spirit was to attempt to climb to the top of the Columbia Hills. 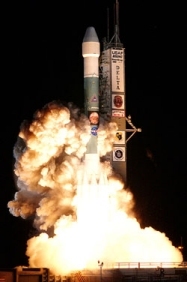 On April 6, 2005, with the two rovers still functioning well, NASA announced another 18 month extension of the mission to September 2006. Opportunity was to visit the "Etched Terrain" and Spirit was to climb a rocky slope toward the top of Husband Hill. Spirit's "postcard" view from the summit of Husband Hill: a windswept plateau strewn with rocks, small exposures of outcrop, and sand dunes. The view is to the north, looking down upon the "Tennessee Valley". This approximate true-color composite spans about 90 degrees and consists of 18 frames captured by the rover's panoramic camera. On August 21, 2005, Spirit reached the summit of Husband Hill after 581 sols and a journey of 4.81 kilometers (2.99 mi). 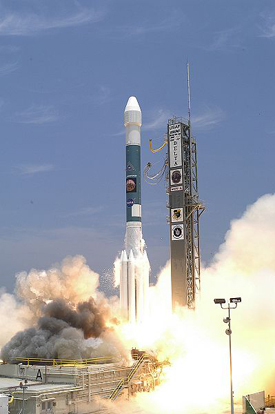 Spirit celebrated its one Martian year anniversary (669 sols or 687 Earth days) on November 20, 2005. Opportunity celebrated its anniversary on December 12, 2005. At the beginning of the mission, it was expected that the rovers would not survive much longer than 90 Martian days. The Columbia Hills were "just a dream" according to rover driver Chris Leger. On February 7, 2006, Spirit reached the semicircular rock formation known as Home Plate. It is a layered rock outcrop that puzzles and excites scientists. It is thought that its rocks are explosive volcanic deposits, though other possibilities exist, including impact deposits or wind/water borne sediment. On March 13, 2006, Spirit's front right wheel ceased working while the rover was moving itself to McCool Hill. Her drivers attempted to drag the dead wheel behind Spirit, but this only worked until reaching an impassable sandy area on the lower slopes. 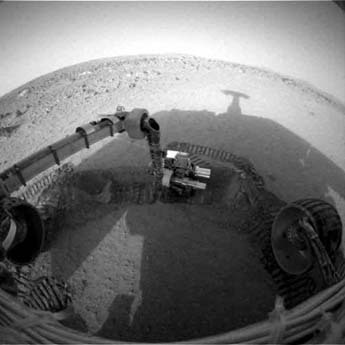 Drivers directed Spirit to a smaller sloped feature, dubbed "Low Ridge Haven", where she spent the long Martian winter, waiting for spring and increased solar power levels suitable for driving. On September 26, 2006, Spaceflight Now reported that NASA has extended mission for the two rovers through September 2007. On September 27, 2006, Opportunity reached the rim of Victoria crater. On February 6, 2007, Opportunity became the first spacecraft to traverse 10,000 meters - 10 kilometers - on the surface of Mars. On June 28, 2007, Opportunity was poised to enter Victoria Crater from its perch on the rim of Duck Bay., but due to extensive dust storms, it was indefinitely delayed until the dust had cleared and power returned to safe levels. 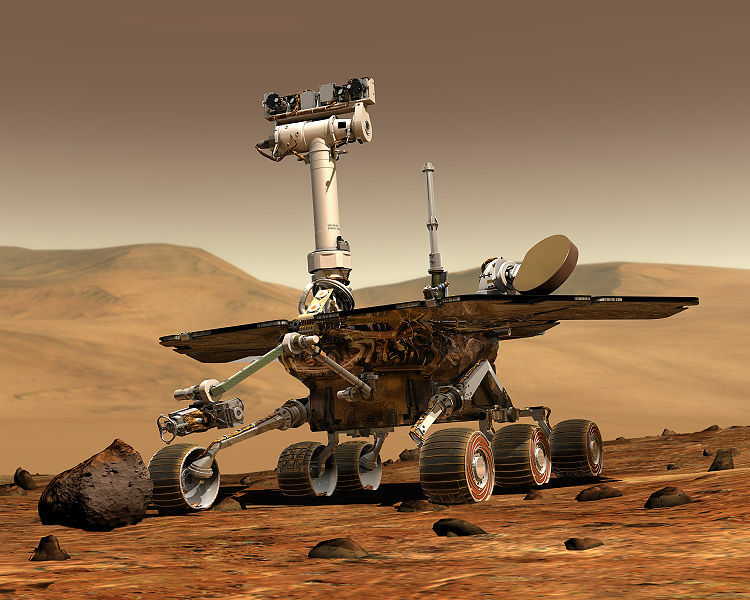 On August 28, 2007, Spirit and Opportunity resumed driving after hunkering down during raging dust storms that limited solar power to a level that nearly caused the permanent failure of both rovers. On October 1, 2007, both Spirit and Opportunity entered their fifth mission extension that could possibly extend operations into 2009, allowing the rovers to have spent five years exploring the Martian surface, pending their continued survival. On January 3, 2008, Spirit entered its fourth year of exploration of Gusev crater. On January 25, 2008, Opportunity entered its fourth year of exploration of Meridiani Planum. On August 26, 2008, Opportunity began to climb out of Victoria crater amidst concerns that power spikes, similar to those seen on Spirit before the failure of its right-front wheel, might prevent Opportunity from ever being able to leave the crater in the event of the failure of one of its wheels. Project scientist Bruce Banerdt has also said, "We've done everything we entered Victoria Crater to do and more." Opportunity will return to the plains in order to characterize Meridiani Planum's vast diversity of rocks--some of which may have been blasted out of craters such as Victoria. The rover had been exploring Victoria Crater since September 11, 2007. On August 29, 2008, Opportunity succeeded in climbing out of Victoria crater, using the same route it took on the way in. On January 3, 2009, Spirit marked 5 years on Mars. Since landing on Mars the two rovers had collectively sent back 250,000 images and traveled over 21 kilometers (13 miles). On January 24, 2009, Opportunity marked 5 years on Mars. On March 7, 2009 Opportunity first saw the rim of Endeavour crater after driving about 3.2 kilometers (2 miles) since it left Victoria crater in August of 2008. On May 26, 2009 Opportunity passed the 10 mile mark (more than 16 kilometers) on sol 1897 while on its way to Endeavour crater. 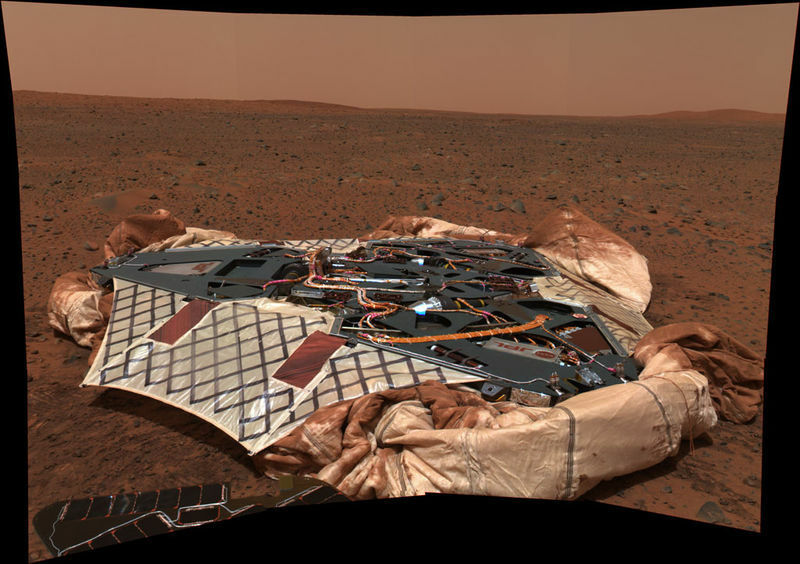 Meanwhile, at Gusev crater, Spirit was dug in deep into the Martian sand much as Opportunity was at Purgatory Dune in 2005. 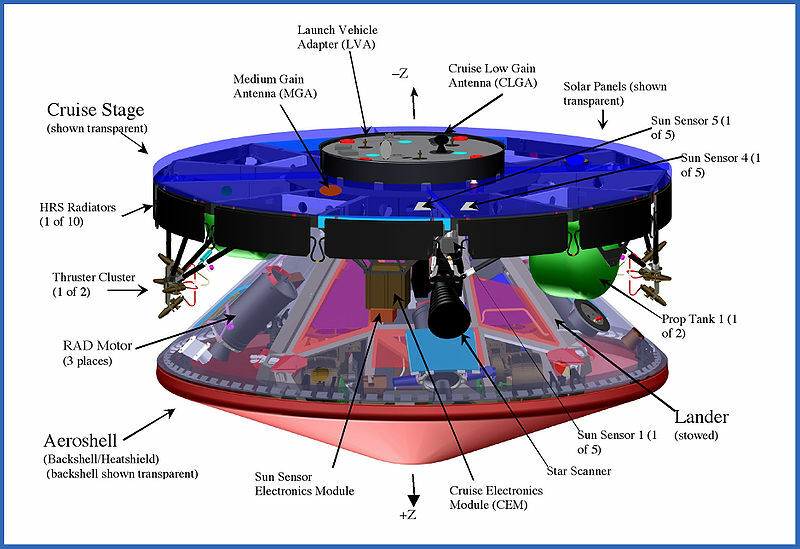 MER cruise stage diagram (Courtesy NASA/JPL-Caltech). Cruise stage of Opportunity rover. 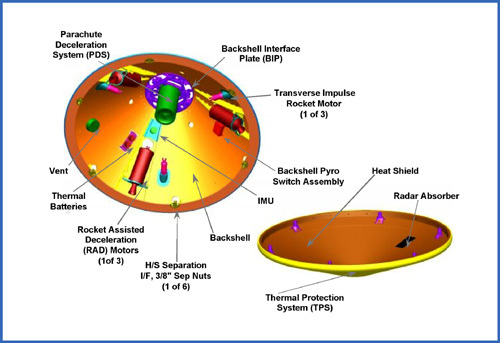 Overview of the Mars Exploration Rover aeroshell. Total mass is 1,063 kg (2,343 lb). The cruise stage is the component of the spacecraft that is used for travel from Earth to Mars. It is very similar to the Mars Pathfinder in design and is approximately 2.65 meters (8.7 ft) in diameter and 1.6 m (5.2 ft) tall including the entry vehicle (see below). Heaters and multi-layer insulation keep the electronics "warm". A freon system removes heat from the flight computer and communications hardware inside the rover so they do not overheat. Cruise avionics systems allow the flight computer to interface with other electronics such as the sun sensors, star scanner and heaters. The star scanner (with a backup system) and sun sensor allowed the spacecraft to know its orientation in space by analyzing the position of the Sun and other stars in relation to itself. Sometimes the craft could be slightly off course; this was expected given the 500 million kilometer (320 million mile) journey. Thus navigators planned up to six trajectory correction maneuvers, along with health checks. Navigators sent commands through two antennas on the cruise stage: a cruise low-gain antenna mounted inside the inner ring, and a cruise medium-gain antenna in the outer ring. The low-gain antenna was used close to Earth. It is omni-directional, so the transmission power that reached Earth fell fast with increasing distance. As the craft moved closer to Mars, the Sun and Earth moved closer in the sky as viewed from the craft, so less energy reached Earth. Then, the spacecraft switched to the medium-gain antenna, which directed the same amount of transmission power into a tighter beam toward Earth. During flight, the spacecraft was spin-stabilized with a spin rate of 2 rpm. Periodic updates kept antennas pointed toward Earth and solar panels toward Sun. The aeroshell maintained a protective covering for the lander during the seven month voyage to Mars. Together with the lander and the rover, it constituted the "entry vehicle". Its main purpose was to protect the lander and the rover inside it from the intense heating of entry into the thin Martian atmosphere. It was based on the Mars Pathfinder and Mars Viking designs. The ablator itself is a unique blend of cork wood, binder and many tiny silica glass spheres. 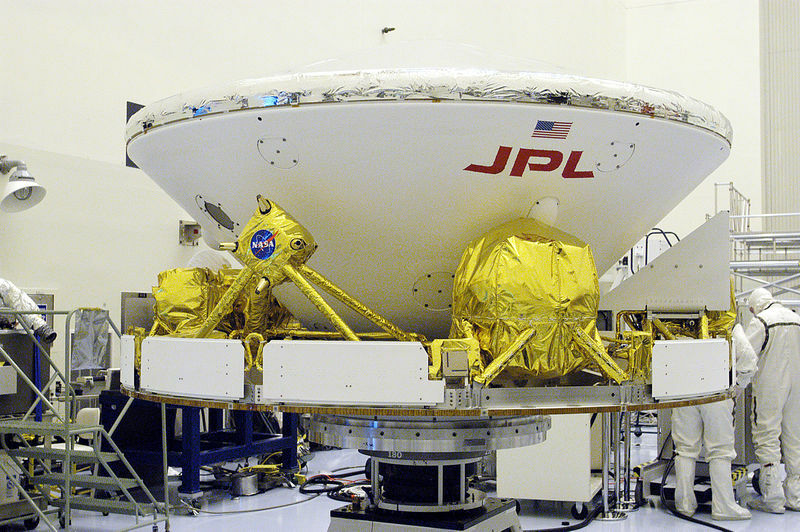 It was invented for the heat shields flown on the Viking Mars lander missions. A similar technology was used in the first US manned space missions Mercury, Gemini and Apollo. It was specially formulated to react chemically with the Martian atmosphere during entry and carry heat away, leaving a hot wake of gas behind the vehicle. The vehicle slowed from 19000 km/h (about 12000 mph) to about 1600 km/h (1000 mph) in about a minute, producing about 60 m/s² (6 g) of acceleration on the lander and rover. The backshell and heat shield are made of the same materials, but the heat shield has a thicker 1/2 inch (12.7 mm) layer of the ablator. Also, instead of being painted, the backshell was covered with a very thin aluminized PET film blanket to protect it from the cold of deep space. 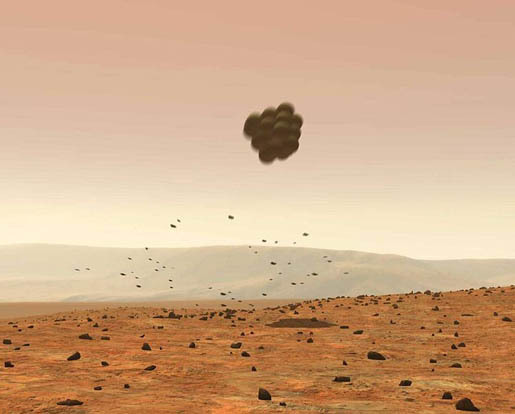 The blanket vaporized during Mars atmospheric entry. 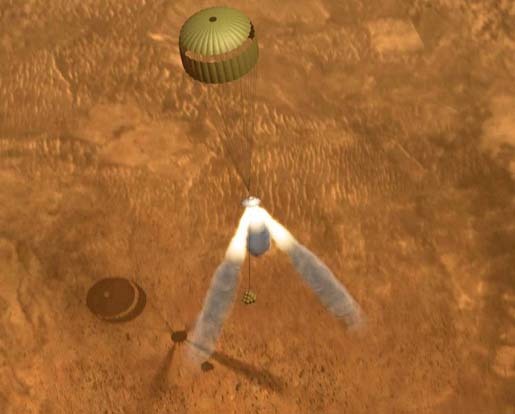 The 2003 parachute design was part of a long-term Mars parachute technology development effort and is based on the designs and experience of the Viking and Pathfinder missions. The parachute for this mission is 40% larger than Pathfinder's because the largest load for the Mars Exploration Rover is 80 to 85 kilonewtons (kN) or 18,000 to 19,000 lbf (85 kN) when the parachute fully inflates. By comparison, Pathfinder's inflation loads were approximately 35 kN (about 8,000 lbf). 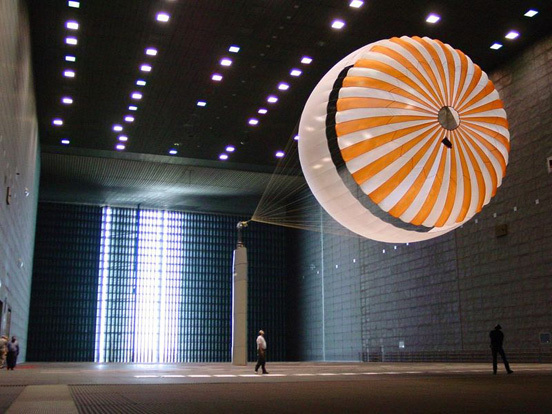 The parachute was designed and constructed in South Windsor, Connecticut by Pioneer Aerospace (website), the company that also designed the parachute for the Stardust mission. The amount of space available on the spacecraft for the parachute is so small that the parachute had to be pressure packed. Before launch, a team tightly folded the 48 suspension lines, three bridle lines, and the parachute. The parachute team loaded the parachute in a special structure that then applied a heavy weight to the parachute package several times. Before placing the parachute into the backshell, the parachute was heat set to sterilize it. Zylon Bridles: After the parachute was deployed at an altitude of about 10 km (6 miles) above the surface, the heatshield was released using 6 separation nuts and push-off springs. The lander then separated from the backshell and "rappelled" down a metal tape on a centrifugal braking system built into one of the lander petals. The slow descent down the metal tape placed the lander in position at the end of another bridle (tether), made of a nearly 20 m (65 ft) long braided Zylon. Zylon is an advanced fiber material similar to Kevlar that is sewn in a webbing pattern (like shoelace material) to make it stronger. The Zylon bridle provides space for airbag deployment, distance from the solid rocket motor exhaust stream, and increased stability. The bridle incorporates an electrical harness that allows the firing of the solid rockets from the backshell as well as provides data from the backshell inertial measurement unit (which measures rate and tilt of the spacecraft) to the flight computer in the rover. 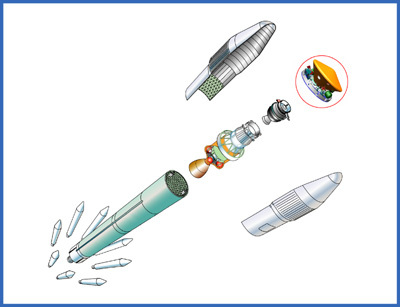 Rocket assisted descent (RAD): motors. Because the atmospheric density of Mars is less than 1% of Earth's, the parachute alone could not slow down the Mars Exploration Rover enough to ensure a safe, low landing speed. The spacecraft descent was assisted by rockets that brought the spacecraft to a dead stop 10–15 m (30–50 ft) above the Martian surface. Airbags used in the Mars Exploration Rover mission are the same type that Mars Pathfinder used in 1997. They had to be strong enough to cushion the spacecraft if it landed on rocks or rough terrain and allow it to bounce across Mars' surface at freeway speeds after landing. The airbags had to be inflated seconds before touchdown and deflated once safely on the ground. Each rover used four airbags with six lobes each, which were all connected. Connection was important, since it helped abate some of the landing forces by keeping the bag system flexible and responsive to ground pressure. The airbags were not attached directly to the rover, but were held to it by ropes crisscrossing the bag structure. The ropes gave the bags shape, making inflation easier. While in flight, the bags were stowed along with three gas generators that are used for inflation. MER lander petals opening (Courtesy NASA/JPL-Caltech). The spacecraft lander is a protective "shell" that houses the rover, and together with the airbags, protects it from the forces of impact. The lander is a tetrahedron shape whose sides open like petals. It is strong and light, and made of beams and sheets. The beams consist of layers of graphite fiber woven into a fabric that is lighter than aluminium and more rigid than steel. Titanium fittings are glued and fitted onto the beams to allow it to be bolted together. The rover was held inside the lander by bolts and special nuts that were released after landing with small explosives. After the lander stopped bouncing and rolling on the ground, it came to rest on the base of the tetrahedron or one of its sides. Then, the sides open to make the base horizontal and the rover upright. The sides are connected to the base by hinges, each of which has a motor strong enough to lift the lander. 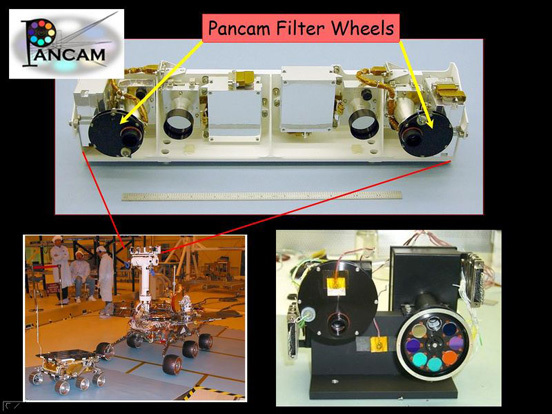 The rover plus lander has a mass of about 533 kilograms (1,175 pounds). The rover alone weighs about 185 kg (408 lb). The gravity on Mars is about 38% of Earth's, so the motor does not need to be as powerful as it would on Earth. The petals initially opened to an equally flat position, so all sides of the lander were straight and level. The petal motors are strong enough so that if two of the petals come to rest on rocks, the base with the rover would be held in place like a bridge above the ground. The base will hold at a level even with the height of the petals resting on rocks, making a straight flat surface throughout the length of the open, flattened lander. The flight team on Earth could then send commands to the rover to adjust the petals to create a safe path for the rover to drive off the lander and onto the Martian surface without dropping off a steep rock. Mars Exploration Rover vs. Sojourner rover (Courtesy NASA/JPL-Caltech). The rovers are six-wheeled, solar-powered robots which stand 1.5 m (4.9 ft) high, 2.3 m (7.5 ft) wide and 1.6 m (5.2 ft) long. They weigh 180 kg (400 lb), 35 kg (80 lb) of which is the wheel and suspension system. Each rover has six wheels mounted on a rocker-bogie suspension system that ensures wheels remain on the ground while driving over rough terrain. The design reduces the range of motion of the rover body by half, and allows the rover to go over obstacles or through holes that are more than a wheel diameter (250 mm or 10 inches) in size. Each wheel also has cleats, providing grip for climbing in soft sand and scrambling over rocks. Each wheel has its own motor. The two front and two rear wheels each have individual steering motors. This allows the vehicle to turn in place, a full revolution, and to swerve and curve, making arching turns. The rover is designed to withstand a tilt of 45 degrees in any direction without overturning. However, the rover is programmed through its "fault protection limits" in its hazard avoidance software to avoid exceeding tilts of 30 degrees. Each rover can spin one of its front wheels in place to grind deep into the terrain. It is to remain motionless while the digging wheel is spinning. The rover has a top speed on flat hard ground of 50 mm/s (2 in/s). But its average speed is 10 mm/s because its hazard avoidance software causes it to stop every 10 seconds for 20 seconds to observe and understand the terrain it has driven into. When fully illuminated, the rover triplejunction solar arrays generate about 140 watts for up to four hours per Martian day (sol). The rover needs about 100 watts to drive. Its power system includes two rechargeable lithium ion batteries weighing 7.15 kg (16 pounds) each, that provide energy when the sun is not shining, especially at night. Over time, the batteries will degrade and will not be able to recharge to full capacity. For comparison, the future Mars Science Laboratory is expected to last approximately one Martian year using radioisotope thermoelectric generators to power its many instruments. Solar panels are also being considered, but RTGs provide versatility to work in dark environments and high latitudes where solar energy is not an efficient way to generate power. It was thought that by the end of the 90-sol mission, the capability of the solar arrays to generate power would likely be reduced to about 50 watts. This was due to anticipated dust coverage on the solar arrays, and the change in season. But over three Earth years later, the rovers' power supplies hovered between 300 watt-hours and 900 watt-hours per day, depending on dust coverage. 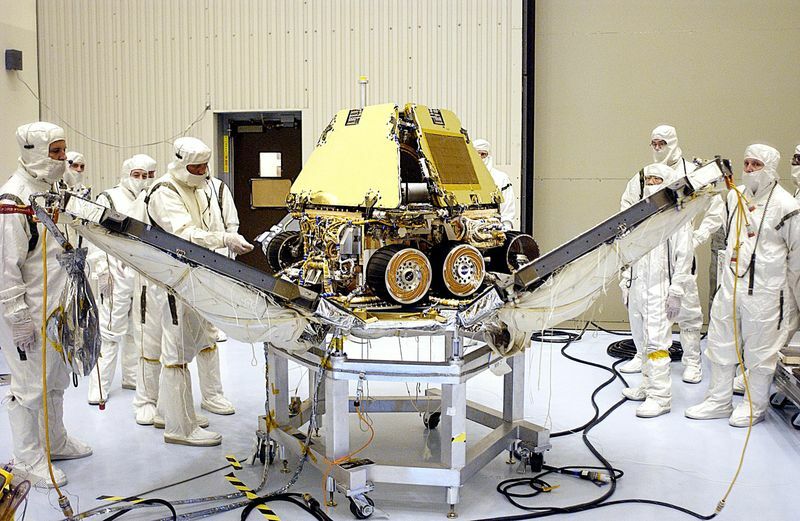 Cleaning events (probably wind) have occurred more often than NASA expected, keeping the arrays relatively free of dust and extending the life of the mission. During a 2007 global dust storm on Mars, both rovers experienced some of the lowest power of the mission; Opportunity dipped to a mere 128 watt-hours. 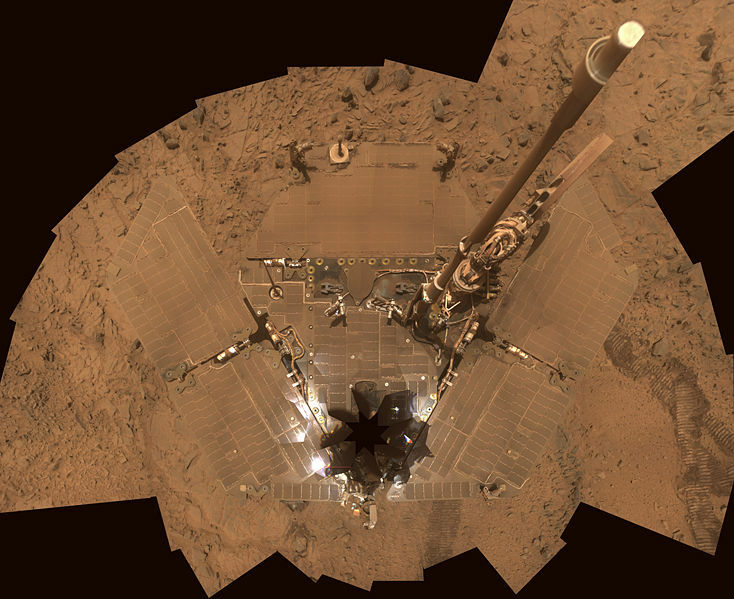 In November 2008 Spirit had overtaken this low-energy record with a production of only 89 watt-hours, due to dust storms in the region of Gusev crater. The rovers run a VxWorks embedded operating system on a radiation-hardened 20 MHz RAD6000 CPU with 128 MB of DRAM with error detection and correction and 3 MB of EEPROM. Each rover also has 256 MB of flash memory. To survive during all of the various mission phases, the rover's vital instruments must stay within a temperature of −40 °C to +40 °C (−40 °F to 104 °F). At night the rovers are heated by eight radioisotope heater units (RHU) which each continuously generate 1 W of thermal energy from the decay of radioisotopes, along with electrical heaters that operate only when necessary. A sputtered gold film and a layer of silica aerogel are used for insulation. The rover has a low-gain and a high-gain antenna. The low-gain antenna is omnidirectional, and transmits data at a low rate to Deep Space Network (DSN) antennas on Earth. The high-gain antenna is directional and steerable, and can transmit data to Earth at a higher rate. The rovers also use the low-gain antennas to communicate with spacecraft orbiting Mars, the Mars Odyssey and (before its failure) the Mars Global Surveyor. The orbiters relay data from and to Earth; most data to Earth is relayed through Odyssey. The benefits of using the orbiters are that they are closer to the rovers than the antennas on Earth, and have view of Earth for much longer than the rovers. The orbiters communicate with the rovers using UHF antennas, which have shorter range than the low and high-gain antennas. One UHF antenna is on the rover and one is on a petal of the lander to aid in gaining information during the critical landing event. The rovers have a total of 9 cameras, which produce 1024-pixel by 1024-pixel images at 12 bits per pixel, but most images are truncated to 8 bits per pixel. They are then compressed using ICER before being stored and sent to Earth. Navigation, thumbnail, and many other image types are compressed to approximately 1 bit/pixel. Lower bit rates (less than 0.5 bit/pixel) are used for certain wavelengths of multi-color panoramic images. 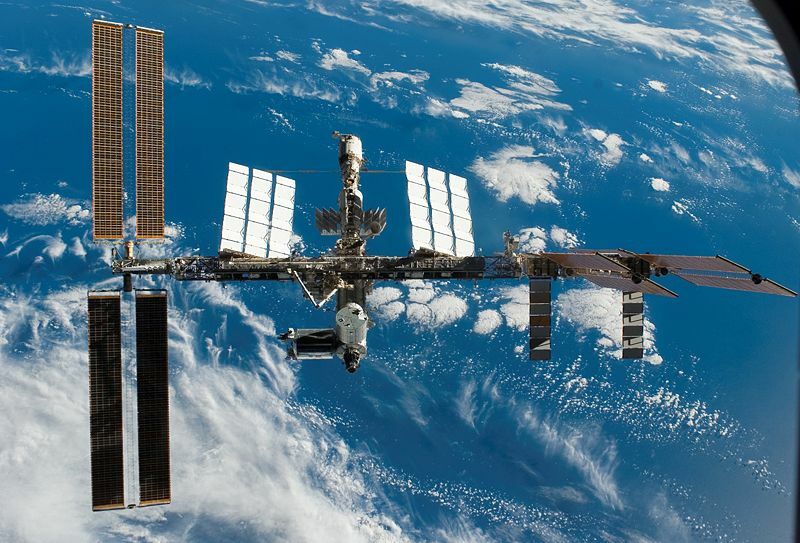 ICER is based on wavelets, and was designed specifically for deep-space applications. It produces progressive compression, both lossless and lossy, and incorporates an error-containment scheme to limit the effects of data loss on the deep-space channel. It outperforms the lossy JPEG image compressor and the lossless Rice compressor used by the MPF mission (Mars Pathfinder). MER Panoramic Camera (Courtesy NASA/JPL-Caltech). An image from Miniature Thermal Emission Spectrometer (Mini-TES), an instrument on the probe that is used for identifying rocks. Alpha particle X-Ray Spectrometer (APXS) (Courtesy NASA/JPL-Caltech). A mirror for the Miniature Thermal Emission Spectrometer (Mini-TES), which identifies promising rocks and soils for closer examination, and determines the processes that formed them. It was built by Arizona State University. See the main Mini-TES article. The cameras are mounted 1.5 meters high on the Pancam Mast Assembly. One motor turns the assembly horizontally a whole revolution. Another points the cameras vertically, at most straight up or down. A third motor points the Mini-TES, up to 30° above the horizon and 50° below. The assembly was built by Ball Aerospace & Technologies Corp., Boulder, Colorado, as was the High-Gain Antenna Gimbal (HGAG). 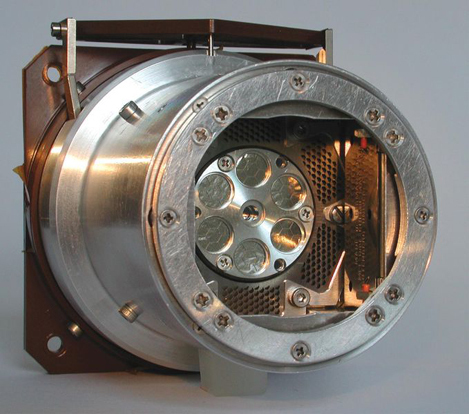 Alpha Particle X-Ray Spectrometer (APXS), developed by the Max Planck Institute for Chemistry in Mainz, Germany, is used for close-up analysis of the abundances of elements that make up rocks and soils. Rock Abrasion Tool (RAT), developed by Honeybee Robotics, for removing dusty and weathered rock surfaces and exposing fresh material for examination by instruments on-board. Prior to this, during the development and building of the rovers, they were known as MER-1 (Opportunity) and MER-2 (Spirit). Internally NASA also uses the mission designations MER-A (Spirit) and MER-B (Opportunity) based on the order of landing on Mars (Spirit first then Opportunity).